Biomedical writing serves two equally important purposes. The first is to inform peers about the outcomes of one’s research; the second is to get recognition for that work. Several well-defined, self-explanatory rules, such as honesty, truthfulness and reproducibility, govern the conduct and publishing of research. However, the description of who qualifies as an author is more complex, which makes authorship one of the most vexed issues in the biomedical publication process. International Committee of Medical Journal Editors (ICMJE). 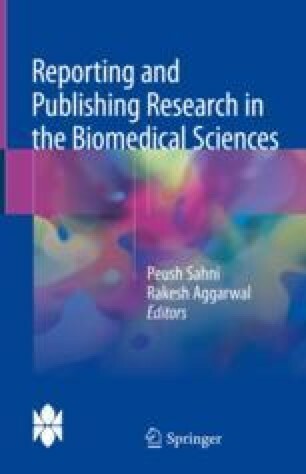 Recommendations for the conduct, reporting, editing, and publication of scholarly work in medical journals. 2014. http://icmje.org/recommendations. Accessed 1 May 2015. Albert T, Wager E. How to handle authorship disputes: a guide for new researchers. The COPE Report 2003; pp. 32–34. http://www.publicationethics.org/files/2003pdf12.pdf. Accessed 1 May 2015. Council of Science Editors (CSE). White paper on publication ethics. http://www.councilscienceeditors.org/resource-library/editorial-policies/white-paper-on-publication-ethics. Accessed 1 May 2015. Committee on Publication Ethics (COPE). Flowcharts. http://www.publicationethics.org/resources/flowcharts. Accessed 1 May 2015. World Association of Medical Editors (WAME). Policy statements. http://www.wame.org/about/policy-statements#Authorship. Accessed 1 May 2015. Wager E, Kleinert S. Responsible research publication: International standards for authors. http://www.publicationethics.org/files/International%20standards_authors_for%20website_11_Nov_2011.pdf. Accessed 1 May 2015.